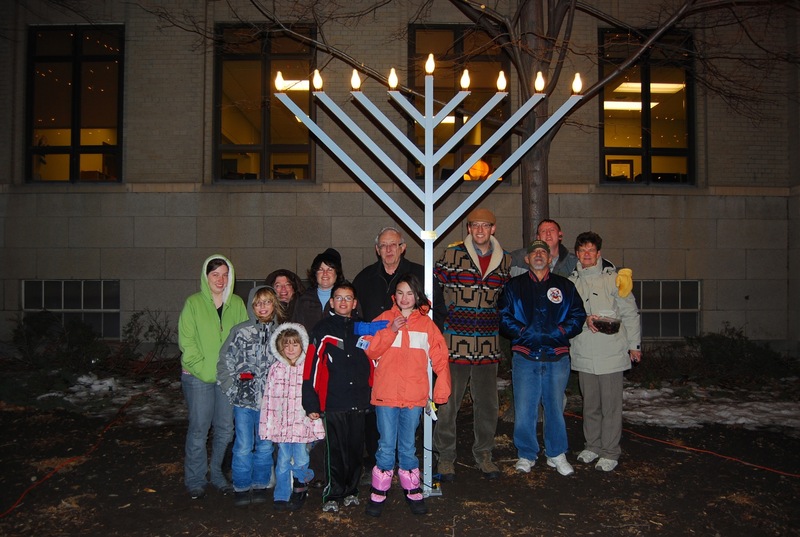 Civic Center Chanukiah Lighting Schedule! Once again, congregant Marty Foxman has offered to organize our daily public lighting of the Diane Kaplan Memorial Chanukiah at the Great Falls Civic Center, which will be each evening during Chanukah, promptly at 5:30 p.m.
Aitz Chaim donated the nine foot Chanukiah to the City of Great Falls in 2009, in memory of our friend and former congregant Diane Kaplan. Since that time, the City has displayed it each December in front of the Civic Center, directly to the south of the decorated tree. For the first night of Chanukah, December 20, we will nosh on sufganiyot prior to the lighting. This year, Chanukah begins on the evening of December 20 and concludes on December 28. Posted on December 5, 2011, in December 2011, Events. Bookmark the permalink. 1 Comment.